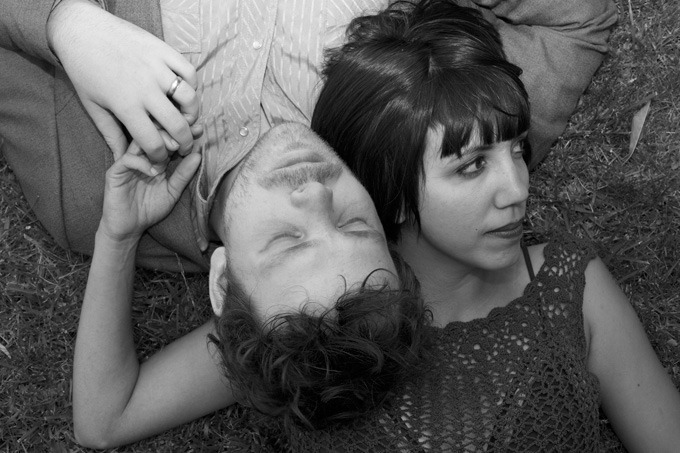 • For those who were introduced to the laid-back indie Americana sound of Big Harp through their acclaimed 2010 debut White Hat, Chain Letters is going to come as a shock. 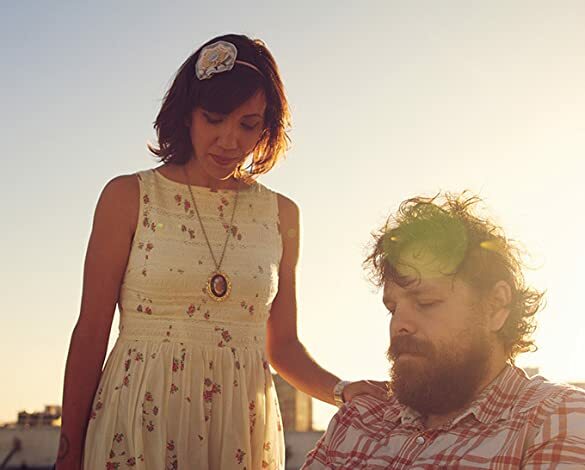 Los Angeles-based husband-and-wife duo Christopher Senseney and Stefanie Drootin-Senseney have evolved as a musical unit. While the lyric and melodic essence of what makes their songs unique remains, they've liberated themselves from White Hat's limited sonic palette. The sound of Chain Letters is built around Stefanie's bass; it's the glue on this album. It's dirty, loud, gritty, and drenched in fuzz -- the dominant engine. Chris' guitar playing is heavily reverbed and soaked in a post-rockabilly, bluesy angularity that lends its heft to every song. (Acoustic guitars don't even make an appearance until "Bar the Doors," the album's fifth track.) John Voris and Ben Brodin add drums and percussion, respectively. Chain Letters is an amalgam of raw, restless country gospel, retro-electric blues, and roots rock & roll. The grain in Chris' voice digs deeply into his lyrics -- whether crooning or snarling -- underscoring their consistent poignancy. "You Can't Save 'Em All" is a clattering rocker that offers four colliding narratives; it expresses a truth that's inherent in every tragic situation: the desire to offer assistance doesn't guarantee redemption for either party. Stefanie's fuzzed bass underscores every line as a prophetic statement. Chris' guitar meets her distorted rhythmic intensity head-on amid skittering snares. The deep blues-gospel in "Some People Are Born Strange" is haunted; the vocal is impure, with a moaning-at-midnight desolation. "Good News" is rockist old-school country-gospel. Chris' voice (and Stefanie's backing) rises above that roots wall of noise to lift the spirit amid everyday life's chaos. "Outside in the Snow" is the precursor to Bob Dylan's "Like a Rolling Stone," but nearly 50 years after the fact. The song's lyric is an exhortation to change perspective before tragedy occurs; its desire is redemption, not accusation. Stefanie's soaring '60s-style girl group vocal chorus illuminates the hope in Chris' warning. The charging "Micajah with His Hands Up" folds gospel and rockabilly raggedly. It's a plea of confused, conditional surrender from a life in ruins; it burns with indignation, self-righteousness, and yearning. "Call Out Your Cavalry," with its shambolic accordion, thumping bass drum, and parlor room tempo vibe, is Stephen Foster via Tav Falco. Chris' ragged baritone reveals loss and hope held in a taut, urgent balance, despite the sweetness in the song's melody and relaxed tempo. Chain Letters is an evolutionary step. Idiosyncratic, revelatory, raucous, it's a nasty, beautiful rock & roll baptism in pleasure, both carnal and spiritual. • "The follow up to 2011's White Hat, Chain Letters is built on a foundation of crackling fuzz bass and angular electric guitars and keyboards. Chain Letters moves away from the rustic, pastoral sound of Big Harp's debut and plays like a series of character sketches centered around escape and surrender, and the blurred borders where the two become indistinguishable." • Un petit côté rétro et néanmoins décalé assez agréable. A découvrir. 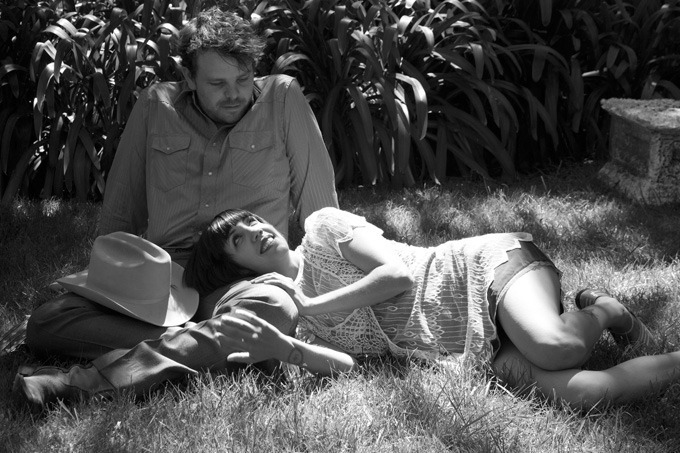 • Chris Senseney and Stefanie Drootin-Senseney (The Good Life, Bright Eyes, She & Him) formed Big Harp in December 2010, after a three-year whirlwind that saw the two meet, have a baby, move halfway across the country, get married, move halfway across the country again, and have another baby. When the dust settled, they holed up in Stefanie's parents' spare bedroom, practiced for a week, and recorded their debut album White Hat, a collection of dusty, low-key folk-rock laced with subtle irony and dark humor. • Understandably for a band that had only existed for a week before recording their first album, and had never played a show, their sound began to change almost immediately. They packed up the kids and hit the road, earning high praise for their surprisingly energetic live shows, where the intimate acoustic-based arrangements they'd recorded gave way to something increasingly complex, ragged and dirty. In March, 2012, only six months after the release of their debut, Big Harp began working on their follow-up, Chain Letters, bringing in old friend John Voris to play drums. The album finds them moving away from the rustic, pastoral sound of their first album and towards a truer union of their L.A.-meets-isolated-cow-town backgrounds. Built on a foundation of crackling fuzz bass and angular electric guitars and keyboards, the songs on Chain Letters play like a series of character sketches with characters caught between escape and surrender, or poised at that edge where the two become indistinguishable.